Often i have seen fellow developer working on one branch and later realizing that they intended to check in the code in a different branch, a simple example, working on the MAIN branch and later realizing that the code needs to be checked in to the QA branch. 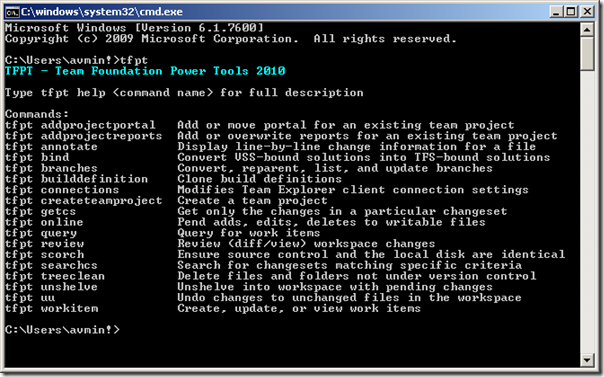 TFS power tool comes to your rescue… when you need to unshelve to a different branch. 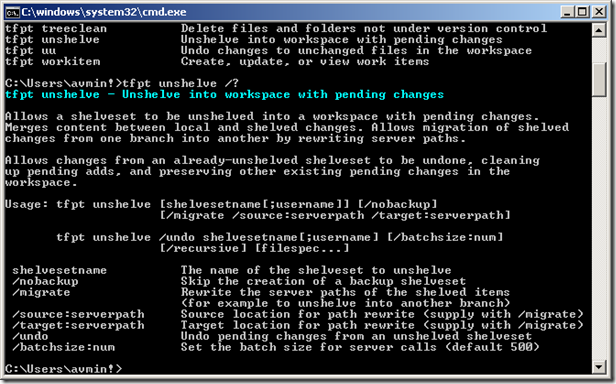 Allows a shelveset to be unshelved into a workspace with pending changes. Merges content between local and shelved changes. 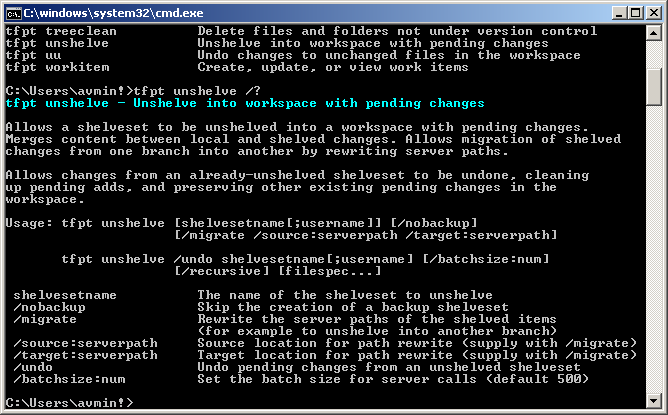 Allows migration of shelved changes from one branch into another by rewriting server paths. Allows changes from an already-unshelved shelveset to be undone, cleaning up pending adds, and preserving other existing pending changes in the workspace. 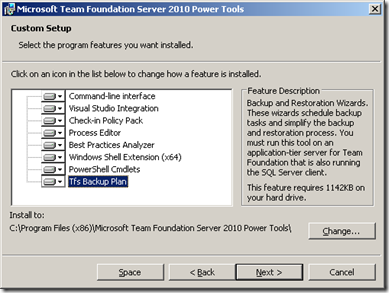 Below is a list of features that are installed with the March 2011 Power tool installation. If you get the error => "unable to determine the workspace"
NOTE: Take the latest from your source control and “cd” to a local path that is mapped to the target workspace. 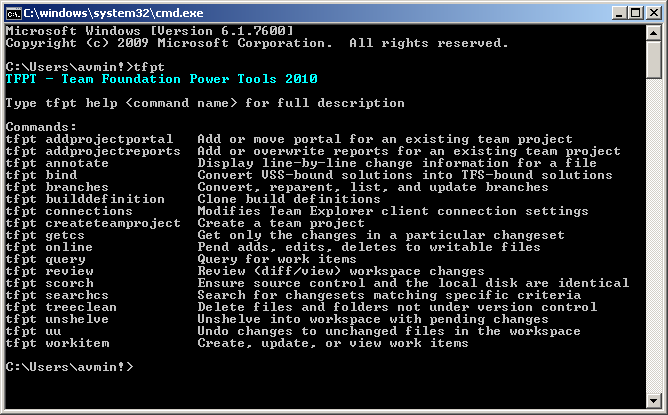 Also ensure that the current working directory is mapped, you can run "tf workspace" and see if the target folders are mapped. Excellent post! My boss told me to use TFPT to move a shelveset to a different branch, and your instructions were perfect. Great Brian! Glad this helped. Thanks for posting this. Helped out in a pinch. Thanks for your comment. Glad to know that it helped. Wouldn't it be great if microsoft made this accessible from the TFS UI itself! I tried this and somehow I am getting error "No whelvesets found matching....." , but I am providing the correct name. I tried providing username along with domain, but still does not work for me. Please let me know what to do. Thanks. Expect to get this error message if the shelveset name is incorrect. Can you verify that the shelveset name is correct and that you keep it in quotes if it has a space inbetween. You can also use the below command to verify that the shelve exists and that you can see the details. Nice feature, although the migrate part does not work for me at all. I provide arguments as explained above. I get no error messages. When I execute the command a GUI like the one in VS2010 pops up, and my shelveset ends up in the source branch. I have no pending changes at all in neither source and target branch. A great feature but it would be even better if it worked. - Are they both in the same team project? I will be able to help. Thanks once again for writing in, hoping to help you resolve the issue. I'm getting the error "The server path component of /source:serverpath was not a valid server path." I followed the instruction as listed. Do you know why this is not working? tfpt unshelve shelvesetname /migrate /source:"$/Project/RootSourcePath" /target:"$/Project/RootTargetPath"
Also, ensure that you run this in the target workspace path else will not work. Thanks for the response Tarun. However, I do have quotes in my paths and also, I copied the path as they would appear from TFS (e.g. "$/folder/sourcefolder" and "$/folder/targetfolder). This i very odd. I also, cd to the target workspace folder prior to running the command. 1. Open up visual studio command prompt and type tf.exe shelvesets /? can you see your shelveset in here? 2. tf dir /? both the source path and the target path to verify they are recognized by the server. 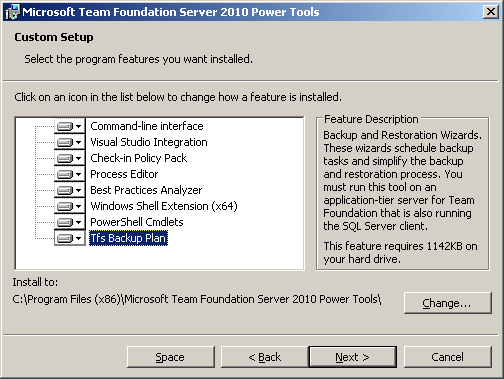 If both step 1 and 2 are success, tfpt command should work, even if the "CD" workspace path is incorrect but the shelveset name, source, target path and connectivity to tfs server is available you will get the pop up message. When I ran the unshelve command, the pop message did come up w/ the shelveset details. However, when I clicked to "Unshelve", the command gave me the error "The server path component of /source:serverpath was not a valid server path." Regarding the 2 instructions you gave me above, does it matter which directory I'm in? The pop up showing up is a step in the right direction. Then it is absolutely worth trying point 2 to validate whether the target path is correct. tf.exe can be run only from the path "C:\Program Files (x86)\Microsoft Visual Studio 10.0\VC>"
I don't see whether it says the path is recognized by the server. I get the same message if i put in the source path. Am i doing something wrong? Surprising enough! This means the command is able to resolve the source and the target paths. I can't think of any other reason of failure migrating shelveset between branches. It might be worth trying this on a separate branch or machine to ensure its not a permission issue. gives me "unable to determine the source control server"
C:\Program Files (x86)\Microsoft Visual Studio 10.0\VC>tf.exe dir itemspec /folders /recursive /collection:"https://avanade.tfspreview.com/defaultcollection"
replace the /collection:"" with the URI of your team server. If you can see the server path you are trying to map to in the unshleve command when u execute the above command, it should work! I am able to view the folders under defaultcollection. However if, I try to view the stuff in one of it's child folder, it gives me an error that it doesn't exist. Is there something wrong w/ my syntax? "https://avanade.tfspreview.com/defaultcollection" is the URI of the TFS Server. "https://avanade.tfspreview.com/defaultcollection/childfolder" will not map to the child directory instead make the tfs uri (Server connectivity address) in correct. Another thing that crosses my mind, have you performed a get latest on the workspace and made sure that the server path maps to the workspace? I am able to get latest and the defaultcollection maps to a folder on my local computer. The folder i'm workin on is a child folder within defaultcollection. I then run this: "C:\Program Files (x86)\Microsoft Team Foundation Server 2010 Power Tolls/tfpt" unshelve "test";miket /migrate /source:"$/docs/sourcefiles" /target:"targetfiles"
does this sound right? This didn't work and I tried changing the target to "$/docs/targetfiles" and that doesn't work either. I also tried "C:\docs\targetfiles" as the target and no avail. I just figured this out. I took out the quotes from the sourcepath and the targetpath and it worked. Thanks for the help. The problem I had was also "Invalid source path" and "Could not find shelve"
I think 2. was the critical thing. I had "unable to determine the workspace" error despite running from a directory that I verified was mapped. 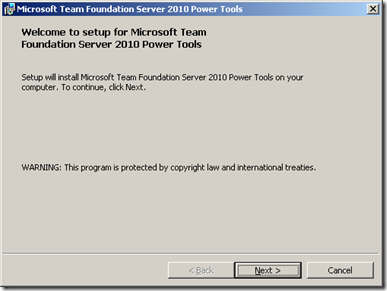 It turns out the problem was the the "tftp.exe" was actually running the TFS Power Tools 2008 version (which I never bothered to uninstall) instead of the TFS Power Tools 2010. Apparently the older version was in my path. It would be nice if it gave some error about a version mismatch when trying to use TFTP on a path mapped using a new version of TFS, but it just says "unable to determine the workspace"
The server path component of /source:serverpath was not a valid server path. Thanks a lot, Tarun. The migration feature for shelvesets across branches worked like a charm. Your documentation is to be commended. @BG - Thanks a lot for the feedback! Wow! I was dreading that I'll have to copy paste all my changes from one branch to the other. Thank God I stumbled upon this, and it worked perfectly! Thanks!! Thanks for that. Though I don't see this as a hidden gem. I think it should be standaard in TFS. It's just another pain when using TFS. Something you don't have with SVN, Git or Hg. It prompted me with a window. i gave the /noprompt option to the above command. it didn't unshelve my shelveset. instead it gave a message "The shelveset had a number of pending sets that was not exactly one." Is there anyway to unshelve multiple changes without being prompted? Thanks a ton man.. worked perfectly fine for me.. saved me a lot of effort and time.. I had a strange problem: the program appeared to make all the changes correctly, including the GUI parts, but then the changes never actually took place. It turns out I uses backslashes instead of slashes in the target and source paths, causing it to silently fail.